An ex-husband and wife team are reunited to star in a musical version of Shakespeare's "Taming of the Shrew", but off-stage the production is rife with ex-lovers' quarrels and gangsters looking for kickbacks. Merriment abounds in this most classic of Broadway musicals. 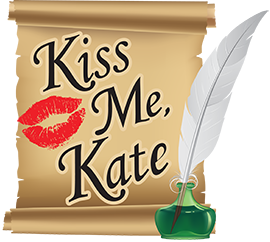 "Kiss Me Kate at Plaza Theatre Company a first-class musical"
DARON COCKERELL (Lilli Vanessi & Katharine Minola) Daron is delighted to be performing again at Plaza with JaceSon, Jonathan, her dad Tom, and the rest of this lovely cast! Some favorite Plaza roles include Mother in RAGTIME, Janet in THE DROWSY CHAPERONE, Cinderella in INTO THE WOODS, Annie Oakley in ANNIE GET YOUR GUN and Gertrude in SEUSSICAL. Other recent productions include Susan in THE DESERT SONG (Lyric Stage), Lynette “Squeaky” Fromme in ASSASSINS (Theatre Three), and Jo in LITTLE WOMEN (Granbury Theatre Company). A graduate of Texas Christian University, she uses her Ad/Pr degree during the day before heading to the theatre. Thanks to Aaron for casting me in this great show! JACESON P. BARRUS (Fred Graham & Petruchio) JaceSon is pleased and proud to be appearing in his 51st production on the Plaza stage - and in a role he is thrilled to be playing opposite the incomparable Ms. Daron Cockerell. Other roles he's loved playing at PlazaCo include Frank Butler in ANNIE GET YOUR GUN, Father in RAGTIME and Harold Hill in THE MUSIC MAN. His favorite role is as husband and dad however and as ever he sends love to Tina, Tabi, Park, Cam, Eden, Mimi and JJ. CARLEE CAGLE (Lois Lane) Carlee Cagle is thrilled to make her Plaza Theatre Company debut! She holds a BFA in Theatre from Abilene Christian University. You may have seen her recently in Lyric Stage's DESERT SONG, NINE, THE SOUND OF MUSIC, or TOO MANY GIRLS. Some of Carlee's favorite roles include Lucille in PARADE, Agnes in I DO! I DO!, Marmee in LITTLE WOMEN, Alice Beane in TITANIC and Muzzy in THOROUGHLY MODERN MILLIE. Carlee would like to thank her friends and family for their support, Aaron Siler and the Plaza staff for the opportunity, and above all, God, who is the provider and sustainer of all of her abilities. Enjoy the show! JONATHAN METTING (Bill Calhoun & Hortensio) You may remember Jonathan from playing in previous PlazaCo shows such as Albert Klummer in DEAR RUTH (where he recently won a Column Award as Best Supporting Actor), Phil Davis is WHITE CHRISTMAS, Mr. Green in CLUE: THE MUSICAL, Rev. Oglethorpe in SMOKE ON THE MOUNTAIN, Hunter in [title of show], and many others. Past favorite roles include: Huck in BIG RIVER, Freddy in MY FAIR LADY, Charlie in GOOD MAN...CHARLIE BROWN, Dickon in SECRET GARDEN, Barnaby in HELLO DOLLY, Barrett in TITANIC, Man 1 in SONGS FOR A NEW WORLD, Younger Brother in RAGTIME, Gary/Roger in NOISES OFF, Happy in DEATH OF A SALESMAN, Laurie in LITTLE WOMEN, John the Baptist/Judas in GODSPELL, Armand in THE SCARLET PIMPERNEL, and Bob Cratchit in A CHRISTMAS CAROL. "Special thanks to Mom, Dad, and little P for putting up with my crazy schedule." MICHAEL D. DURINGTON (First Man) Michael is pleased to be returning for his third production at PTC after playing the roles of Andre' Thibauld in DIRTY ROTTEN SCOUNDRELS and Benny Southstreet in GUYS AND DOLLS. Having played many roles in his twenty years in the Metroplex, he counts Sir Robin (in the Column award winning GLCT production of SPAMALOT), Max Detweiler (SOUND OF MUSIC), Marcellas Washburn (MUSIC MAN), Albert Peterson (BYE, BYE BIRDIE), Pharoah (JOSEPH...DREAMCOAT) and Sparky (FOREVER PLAID among his all time favorites. Always remember....you're never fully dressed without a smile! G. AARON SILER (Director, Second Man) Aaron is one of the four founding producers of Plaza Theatre Company and has performed in many different shows here such as Tevye in FIDDLER ON THE ROOF, Nicely Nicely Johnson in GUYS AND DOLLS, Horton in SEUSSICAL, Charlie Brown in GOOD MAN...CHARLIE BROWN, Buffalo Bill in ANNIE GET YOUR GUN, and many more. Aaron has also won multiple Column Awards for Best Actor in a Musical, Best Director, Best Scenic Design, and Best Sound Design, and the Rudy Seppy Volunteer Award. Aaron is a proud father of three wonderful kids and husband to Milette Siler. KRISTI TAYLOR (Hattie) Kristi's back for her sixth show here at Plaza! You might've seen her recently in CASH ON DELIVERY as Sally Chessington or in several other plays/musicals around the DFW area. Some of favorite roles include Mrs. Hawkins in TREASURE ISLAND, Dolly Tate in ANNIE GET YOUR GUN, and Rona Pereti in the 25th ANNUAL...SPELLING BEE. Kristi would like to thank her family and friends for their continued support! JESSE BOWRON (Ralph & Lucentio) You may remember Jesse from previous PlazaCo productions BYE, BYE BIRDIE and DEAR RUTH. Jesse began performing and dancing when he joined the Consuming Fire drama team at Eastern Heights Church at age 12. Jesse enrolled in several theater-based classes at Travis Academy Of Fine Arts and has since performed with Travis Academy of Fine Arts (TAFA) many times. LEVI KING (Gregory & Gremio) Levi is proud to take take the stage for his ninth performance at Plaza Theatre Company! A graduate of Crowley High School, he previously appeared on stage in the PlazaCo productions of RAGTIME, DIRTY ROTTEN SCOUNDRELS, BYE BYE BIRDIE, and WHITE CHRISTMAS, as well as the Granbury Theatre Company production of FIDDLER ON THE ROOF, and those are just his favorites! He would like his mother for introducing him to the amazing community of theatre, as well as all the friends that have made the experience great. TOM COCKERELL, JR. (Harry Trevor & Baptista Minola) Tom is happy to be in his fifth production at Plaza theater. Previous shows include Sound of Music, Singing in the Rain, The Music Man, and Joseph…. Again he is pleased to share the stage with his daughter Daron and his wife Patti who is the assistant stage manager. Tom follows in the tradition of his brother Perry who played in Kiss Me Kate at Stolen Shakespeare. Perry, an attorney in Dallas who regularly plays in the annual Bar None Review got his start in show business because of his uncanny ability to mimic jungle animal sounds which were actually used in the original Tarzan movies. Tom thanks the Plaza staff for casting him and his family who put up with him. LUKE HUNT (General Harrison Howell) This is Luke's 22nd production at Plaza Theatre Company. He has appeared on the Plaza stage as Long John Silver in TREASURE ISLAND, Froggy LeSeuer in THE FOREIGNER (for which he won a 2013 Column Award for best featured actor in a non-equity play), himself and a few other people in THE COMPLEAT WORKS OF WILLIAM SHAKESPEARE (abridged), The Duke/Dr. Carrasco in MAN OF LA MANCHA, and most recently as Judge Harry Wilkins in DEAR RUTH. He has also acted with the Granbury Theatre Company as John Dickinson in 1776, Eric Swan in CASH ON DELIVERY, and Lloyd Dallas in NOISES OFF! and locally with the Carnegie Players as Aslan in LION...WARDROBE, Count Dracula in DRACULA, and Thomas Jefferson in 1776. Luke is the new Theatre Arts Director at Alvarado High School and is a co-owner of Dance Across Cleburne with his wife, Rachel. STACEY GREENAWALT (Padua Inn Waitress/Singer) Stacey was recently seen as Brenda in PTC's CASH ON DELIVERY and The Detective in CLUE THE MUSICAL, both favorite roles. Others include Jolene Oakes in DIRTY ROTTEN SCOUNDRELS, Clairee Belcher in STEEL MAGNOLIAS, and both Yente and Fruma-Sarah in two different productions of FIDDLER ON THE ROOF. She's a recent Column Award nominee for her costuming work, and you can see her as Lotty Wilton in PTC's upcoming ENCHANTED APRIL. She's a theatre and choral nerd who's been singing and performing for thirty years on various stages--cedar chests, school cafeterias, backyard monkey bars, gymnasiums, football fields, churches, auditoriums, showers, and... well, theatres. When she's not costuming, rehearsing, performing, or hanging with her very talented friends, Stacey is a busy Supported Employment Specialist with Goodwill. She's also an accomplished artist, professional photographer, published author, mom to two truly fabulous teens (love you guys! ), and shower show-tune diva exraordinaire. BRITTANY HOLCOMB (Wardrobe Lady) Brittany is thrilled to be working with Plaza Theater Co. Brittany holds a Bachelors of Music from UMKC Conservatory of Music and has enjoyed studying and performing music for the past 18 years. She has enjoyed performing in a variety of roles that include opera, musical theater, cabaret and chorales. One of Brittany's most exciting role was as a fire stunt performer in the Outdoor Musical TEXAS in Palo Duro Canyon. She was most recently seen playing a kings wife in THE KING AND I presented by Plaza Theater Co. She would like to thank her family, friends, and wonderful teachers for their love, support, patients, and encouragement. ASHLYN KEITH (Dancer, Ensemble) Ashlyn is excited to participate in her first performance with Plaza Theatre. She has enjoyed learning the theatre ropes from her cast mates and can't wait to audition for the next show. Although this is her first theatre appearance she has performed in many dance recitals and enjoys being on stage. Ashlyn is a very active 14 year old homeschooled student. She has been dancing for 6 years, and has taken musical theatre at Theatre Arlington. Ashlyn currently takes ballet, jazz, hip hop, pointe and contemporary at Studio C in Burleson. She also takes voice lessons with Brenda Tippie of Crowley. "Thank you Mrs. Ashley and Mrs. Brenda for showing me the way." NICOLE MCDONALD (Padua Maiden, Dancer) NICOLE MCDONALD grew up in Cleburne, TX. She recently graduated from Angelo State University, and was involved in shows such as THE WHO'S TOMMY, THE TEMPEST, and THE BEST LITTLE WHOREHOUSE IN TEXAS. She is happy to be a part of KISS ME KATE as her first show at Plaza. She would also like to think her mom, dad, and boyfriend for all their support! JAMIE LONG (Pops, Padua Priest, Haberdasher) This is the James 16th show at the Plaza. Some of the other shows he has been in include Feldzeig in THE DROWSY CHAPERONE, Colonel Pickering in MY FAIR LADY, Bishop Lax in SEE HOW THEY RUN, Dr Willie Chumley in HARVEY, and Franz in THE SOUND OF MUSIC. His most recent appearance was as Seldson in NOISES OFF at Granbury Theater. Some of his other favorite roles were as the Pschistrist in NO TIME FOR SERGEANTS, Representative Stephen Hopkins in 1776, and Clarence Oddbody in IT’S A WONDERFUL LIFE. Thanks to Aaron Siler for letting him share the stage with such a wonderful and talented cast and crew. Enjoy the show and be sure and look for Next Years exciting list of productions soon. CHERI DEE MEGA (Music Director) Cheri has been a part of Plaza Theatre Company since the very beginning as the music director for our preview week performances and the music director for YOUR A GOOD MAN CHARLIE BROWN. You may remember her from CLUE THE MUSICAL as the piano player or in all of the SMOKE productions and as the musical director for numerous other productions here at PlazaCo and also at Artisan Center Theater in Hurst. Cheri is the music teacher and choral director at Stone Gate Christian Academy in Irving, TX and also instructs private piano, voice, and guitar. Plaza provides an amazing place for families to be entertained and Cheri is so grateful for JaceSon, Tina, Aaron, and Milette for creating an environment where young artists can be mentored in every facet of theater. "Thank you for pouring into my son's life." Cheri and her husband, Brian have reared one son, Curt, who grew up under JTAM's tutelage. "Thank you to Jesus for His grace to live this blessed life." PATTI COCKERELL (Asst Stage Manager) Patti is excited to be a part of Kiss Me Kate and to have the opportunity to work with Lindsay Hardisty! Patti has stage managed other shows at Plaza Co including BEAUTY AND THE BEAST, THE SOUND OF MUSIC, A CHRISTMAS CAROL and THE MUSIC MAN. She also assisted on JOSEPH. Every show has been a great adventure shared with family members and friends. Thanks to Plaza Theatre Co for this opportunity. Patti considers it almost as much fun as sitting in the audience and watching daughters Daron and Bree and husband Tom perform on stage! Love to Jameson and Erin and other family and friends who will enjoy this show! KARA BARNES (Costumer) Has costumed many shows at Plaza Theatre Company. We are so grateful for Kara's amazing eye for detail and the skill and ability to take on a show of this size and magnitude. TAMMIE PHILLIPS (Properties Designer/Set Decorator) Tammie is lovingly known around the community theater world as "Prop Momma" and she truly adores her job as properties manager here at Plaza Theatre Company. KISS ME, KATE has been a fun and unique challenge to design props and set decor for because the time era throughout the musical constantly jumps back and forth. She is thrilled to work with such a wonderful production team! Tammie would like to thank her family and friends for supporting her and God for allowing her to use the creative gifts He has blessed her with. "To God be the Glory!"